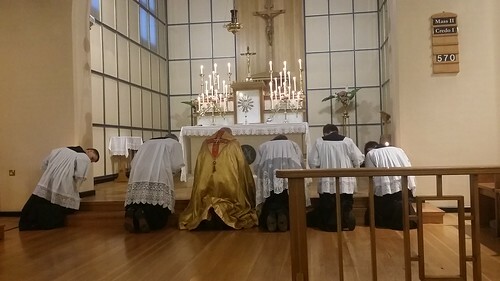 Someone who is very familiar with the traditional Roman rite can tell from a photo exactly what point of the Mass the priest has reached. The above photo is unusual in that the celebrant is at the Gospel side of the altar but facing partially towards the centre. This is the Last Gospel at a Mass where the Blessed Sacrament is exposed. 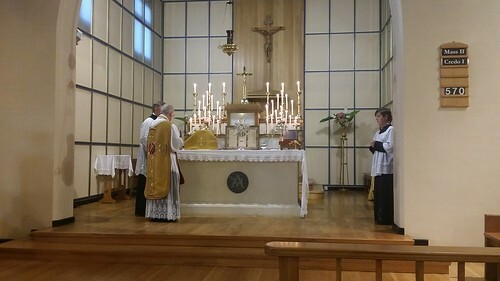 In fact it is the end of our Corpus Christi Mass last Thursday, to the Blessed Sacrament is exposed only after Holy Communion, in preparation for the Blessed Sacrament procession which is concluded by Benediction. 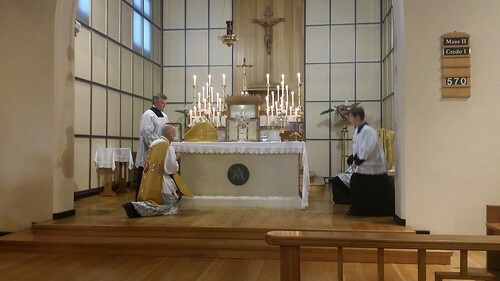 The Mass at the end of the Forty Hours is celebrated entirely coram sanctissimo and so the priest has to adjust various movements so that he never has his back to the Blessed Sacrament. I am always reminded of the scene in "Gladiator" where the gladiators are told to face the emperor "AND DON'T TURN YOUR BACK ON HIM". Our Lord is the King of Kings and infinitely more worthy of respect than an emperor. 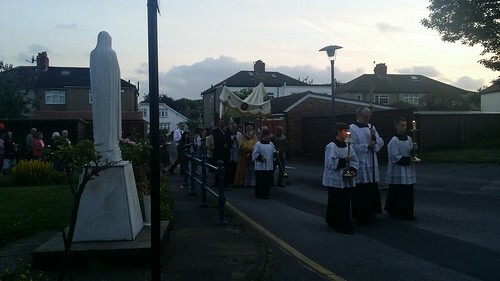 The Missal for the modern rite does in fact say that it is desirable to have a Blessed Sacrament procession after Mass on the feast of Corpus Christi. Many good and orthodox priests who only know the modern rite have restored the procession in recent years. The growing popularity of the usus antiquior where the presumption is that there will be a procession, has helped this process of restoration. Of course, we get to celebrate twice over in Blackfen, because the feast is celebrated in the modern rite on the Sunday. A lot of the nonsense involved in the unpopular Holyday transfers would be overcome if the Octaves were restored, or even if they were explicitly spoken of as an option. Then you could celebrate the feasts on the proper day and celebrate them on the Sunday as part of the Octave.